I have a confession. I love books. Any sort at all. And bookshops. And libraries. As a child I was a voracious reader. There were weekly trips to the local library and to the library where my grandparents lived. One of my favourite games was playing libraries, making the tickets to go in the books (none of this computerised stuff back then!! ), organising the book shelves and fining people when they were late with their books. In recent years I’ve been more ruthless donated lots of my books to the charity shop or friends. Novels I read once and didn’t enjoy,books that I don’t need anymore (7000 baby names) and things that I just won’t look at again. These have been replaced with numerous cookery and craft books, replacing the fictional world with factual things. When bigR was born something amazing happened. I stopped reading. Gone was the 2 books a week rapacious reader and in its place? Nothing. I don’t even know what I did with the time (apart from looking after a baby but you know what I mean). After a year, I started reading again, slowly, maybe a book every other month if I was lucky. Then, suddenly, there was a change and I can only attribute it to one thing. I received a kindle as a birthday gift. 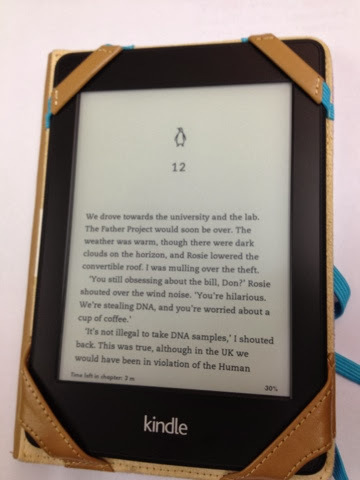 Now I never thought I would like an e-reader. I like the feel of the novel in your hand, the smell of the pages, searching out the book in a book shop but the kindle has been a revelation to me. I can have a huge number of books with me at any time and since Christmas when I received a kindle with an inbuilt light I can read in the dark – (that would’ve been amazing during night feeds!!) My only bugbear is that you can only get books via amazon but there are plenty of self-publishing authors that way so maybe it balances out? Initially, via Leanne, and then Christina and Sarah, I found the reading link up at Circle of Pines. So this month I’m going against my usual trait and becoming a joiner. I’ll be reading The Rosie Project - Graeme Simsion and The Goldfinch - Donna Tartt. (When I’ve worked out how to add myself to the links I will!!) I’m looking forward to finding lots of new books to enjoy. Like you I have an e-reader, but much prefer the a paper book any day. I've not heard of your authors but will look them up. I love the feel of a real book in your hand but the e-reader has been invaluable in getting me back into reading. I've only listened to audiobooks on long flights/car journeys. My car journeys are now taken up with Julia Donaldson audiobooks!! You'll get the linkup sorted out easily enough, I'm sure. Oh, and now I want a Kindle!!! I have read and reread The Secret History so many times now. It's such a good book. We take the girls to the library and also end up buying them books as well. They both love to 'read' and be read to. It's strange I don't remember being read to as a child only reading myself and numerous library trips....even though my parents promise they did read to me!! The same thing happened to me when I had babies. It was so hard to read. I just starting using an e-reader myself and I like it well enough but it will never be a substitute for my beloved real books. Babies and books don't mix....well not very easily. No I agree an e-reader is not a substitute for a beautiful book!! Babies and books don't mix. Babies and magazines do. I have a LOT magazines! Like you I read a couple of books a week until I had children. Then I stopped. I was too exhausted, and at night all I wanted to do was get those zzzzzzz's in while I could. My MUm pushed me into joinging a book group when Olly was about a year old. It made me read a book a month (I don't like to let anyone down) and also gave me some me time again. That was important. I'm really looking forward to this project, because I get to choose what I read, and I can pick up recommendations for all of you too! Don't get me started on magazines! I love a magazine. Although my tastes have definitely changed more to food and craft than the women's glossies. Like you, I'm not a joiner-in but this being about books, afraid I couldn't resist. And I can't tell you how excited I was (and really at my age that is just ridiculous) to read about someone who used to play libraries, even making the little tickets that go inside - or used to before all this computerised stuff. I even had a little printing set and had a piece of paper inside the book on which I would stamp the date it was due back. Never thought to fine people though, bit slow there.... that was back in the late fifties and into the early sixties, when children's games seemed to reflect real life more than these computer games, thank heavens! Ooh now a printing set is something I would love now!! BigR often reads to her toys and although she has access to a computer her first choice is always a pretend game....that'll probably change as she gets older.